The easiest way to create your accompaniments from MIDI files!. 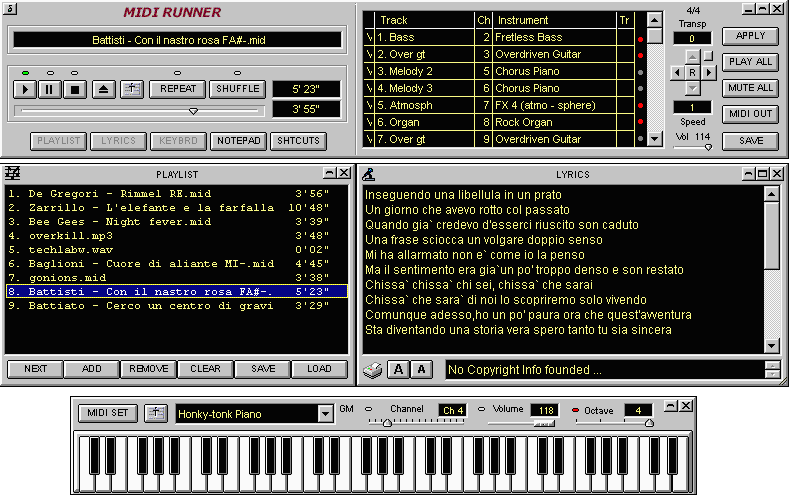 MidiRunner is also a Jukebox for MIDI,MP3,Wave,CD-Audio,WindowsMedia that allows to play the MIDI instruments (or soundfonts) togheter with the running file using an external MIDI keyboard, the PC keyboard or a virtual keyboard. When playing a MIDI file you can also: - extract the lyrics contained into the MIDI file - disable some selected MIDI tracks and change their instruments - increase/decrease the song tonality (transpose) - increase/decrease the playback rate of the song - save the MIDI variations and settings into new standard MIDI files, to create your personal MIDI accompaniments. MidiRunner can also be used to create, edit and load Playlists (PLL/M3U/PLS). Estensive use of shortcuts to also work without mouse. Full Help-on-line. Language: English/Italiano.